The MillerCalib function, now included in the modEvA package (version 0.7.2 just released), calculates Miller’s (1991) calibration statistics for a logistic regression model, namely the intercept and slope of the regression of the binary response variable on the logit of predicted probabilities. Optionally and by default, it also plots the corresponding regression line (black) over the reference diagonal (grey dashed line). Calibration (or reliability) measures how a model’s predicted probabilities relate to observed species prevalence or proportion of presences in the modelled data. If predictions are perfectly calibrated, the slope will equal 1 and the intercept will equal 0, so the model’s calibation line will perfectly overlap with the reference diagonal. Note that Miller’s statistics assess the model globally: a model is well calibrated if the average of all predicted probabilities equals the proportion of presences in the modelled data. Therefore, good calibration is always attained on the same data used for building the model (Miller 1991). The function is more useful to see if a model stays well calibrated when extrapolated to a new dataset. Input data can be either a glm model object with binomial family and logit link, or two vectors of observed binary (0 or 1) values and the corresponding predicted probabilities. The output is a named list with the calibration intercept and slope. Input data can be either a glm model object or two vectors of observed binary (0 or 1) values and the corresponding predicted probabilities (only binomial-logit GLMs admitted in this case). The output is a named list of the calculated R-squared values. See also the Dsquared function. Tjur T. (2009) Coefficients of determination in logistic regression models – a new proposal: the coefficient of discrimination. The American Statistician, 63: 366-372. If you have a list of models created e.g. with the multGLM function, or a data frame with presence-absence data and the corresponding predicted values for a set of species, you can use the multModEv function to get a set of evaluation measures for all models simultaneously. Note that all models must have the same sample size. This function is included in the modEvA package (Barbosa et al. 2014). colnames(results)[colnames(results) == "kappa"] <- "skappa"
colnames(results)[colnames(results) == "TSS"] <- "sTSS"
REFERENCES: Barbosa A.M., Brown J.A. & Real R. (2014) modEvA – an R package for model evaluation and analysis. R package, version 0.1. 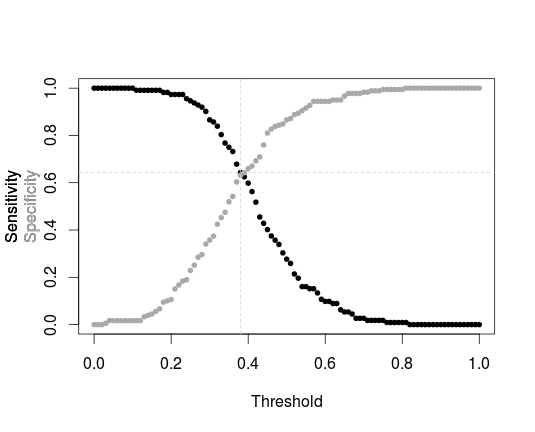 Like the model evaluation measures calculated by the threshMeasures function, the area under the ROC curve (AUC) assesses the discrimination performance of a model; but unlike them, it does not require the choice of a particular threshold above which to consider that a model predicts species presence, but rather averages discrimination performance over all possible thresholds at a given interval. Mind that there has been criticism to the AUC (Lobo et al. 2008, Jiménez-Valverde et al. 2013), although it is still one of the most widely used metrics in model evaluation. It is highly correlated with species prevalence, so this value is also provided by the AUC function (if simplif = FALSE, the default) for reference. Although there are functions to calculate the AUC in other R packages (such as ROCR, PresenceAbsence and verification), the AUC function below is more compatible with the remaining functions in this blog and in the modEvA package where it is included (Barbosa et al. 2014), and can be applied not only to a set of presence-absence versus predicted values, but also directly to a model object of class glm. #points(x = false.pos.rate, y = sensitivity, cex = rev(sqrt(100 * prop.preds)), col = "red")  # but why do I have to rev? Linear models come with an R-squared value that measures the proportion of variation that the model accounts for. The R-squared is provided with summary(model) in R. For generalized linear models (GLMs), the equivalent is the amount of deviance accounted for (D-squared; Guisan & Zimmermann 2000), but this value is not normally provided with the model summary. The Dsquared function, now included in the modEvA package (Barbosa et al. 2014), calculates it. There is also an option to calculate the adjusted D-squared, which takes into account the number of observations and the number of model parameters, thus allowing direct comparison among different models (Weisberg 1980, Guisan & Zimmermann 2000). UPDATE: see also further measures in the new RsqGLM function. The model evaluation functions posted here so far calculate only measures of discrimination capacity, i.e., how well the model is capable of distinguishing presences from absences (after the model’s continuous predictions of presence probability or alike are converted to binary predictions of presence or absence). However, there is another important facet of model evaluation: calibration or reliability, i.e., the relationship between predicted probability and observed prevalence (Pearce & Ferrier 2000; Jiménez-Valverde et al. 2013). The HLfit function, now included in the modEvA package (Barbosa et al. 2014), measures model reliability with the Hosmer & Lemeshow goodness-of-fit statistic (Hosmer & Lemeshow 1980). It also calculates the root mean square error (RMSE). Note that these statistics have some limitations (see e.g. this post at Statistical Horizons), mainly due to the need to group the values into bins within which to compare probability and prevalence, and the influence of the binning method on the result. The HLfit function can use several binning methods, which are implemented in the getBins function provided with it (and also included in modEvA). You should therefore evaluate your model with different binning methods, to see if the results change significantly. The HLfit function uses also the prevalence function. # model: instead of (and overriding) obs and pred, you can provide a model object of class "glm"
HLfit still needs some code simplification, but fixes have recently been applied to the getBins function so that it doesn’t fail when probability breakpoints are not unique. Additional model calibration measures are soon to be added to the package. The optiPair function, now included in the modEvA package (Barbosa et al. 2014), follows the optiThresh, threshMeasures and evaluate functions, which should all be loaded along; and extends (thus replacing) the SensSpecCurve function (now deprecated), in the sense that optiPair can be used with any pair of model evaluation measures that balance each other, such as sensitivity-specificity, omission-commission, or underprediction-overprediction (featured in Barbosa et al. 2013). The function plots both measures in the given pair against all thresholds, and calculates the optimal sum, difference and mean of the two measures. # model: instead of (and overriding) obs and pred, a model object of class "glm"
Barbosa, A.M., Real, R., Muñoz, A.-R. & Brown, J.A. (2013) New measures for assessing model equilibrium and prediction mismatch in species distribution models. Diversity and Distributions, online early (DOI: 10.1111/ddi.12100).